If you need to change the frame or timing of a keyframe in the Timeline view, there are a few different ways to do this. 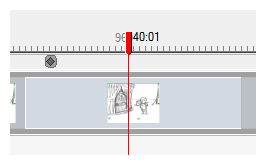 Note that camera keyframes can only be moved to a new location within the same scene. The following two methods are useful when you want to move a keyframe to a new location, or cut and paste a keyframe. To synchronize or snap the keyframes as you move them, see About Keyframe Sync Mode and Snapping Keyframes to Sound Clips. 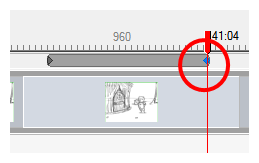 In the Timeline view, select one or more keyframes. Drag the selected keyframe left or right to choose a new position in time. You can only drag it to a new location within the current scene. While you drag the keyframe, its position relative to the scene is displayed in a black box. The number of frames is also displayed from the original position the new keyframe will be located. Select Edit > Cut Camera Keyframes or press Ctrl + X (Windows) or ⌘ + X (Mac OS X). The keyframe is removed and copied to the Clipboard. Within the same scene, move the red playhead to the position on which you want to paste the keyframe. Select Edit > Paste Camera Keyframes or press Ctrl + V (Windows) or ⌘ + V (Mac OS X)).